Dental care is often a forgotten part of a healthy lifestyle. For the HIV-positive person, regular dental care is not only key to maintaining good oral heath but also to protecting your entire body from disease, including those of the heart, lungs, and brain. To some, there also remain concerns about the safety of dental procedures in either spreading or acquiring HIV. Are these concerns real and is there anything you should be doing to prevent infection? Too many people take their dental health for granted until they get a toothache or sore that interferes with their day-to-day life. While this is true for people in general, individuals with weakened immune systems are at particular risk. Ulcers, gum disease, and tooth decay are all conditions that can cause serious illness if they spread from the mouth and disseminate throughout the entire body. Candidiasis (thrush), which is often the first sign of HIV infection as well as a later-stage infection that can be classified as an AIDS-defining condition when it disseminates throughout the body. Herpes simplex (HSV), which is common in both HIV-infected and non-infected people, but can also be classified as an AID-defining condition if lasting for more than a month or presenting in the lungs, bronchi, or esophagus. Oral hairy leukoplakia (OHL), which can be predictive of advancing disease in people with untreated HIV infection. Bacterial periodontal diseases, some of which (like necrotizing ulcerative periodontitis) are associated with advancing immune collapse. Identifying oral health concerns early allows for treatment before the problems progress to other, more serious complications. How Safe Are Dental Procedures? 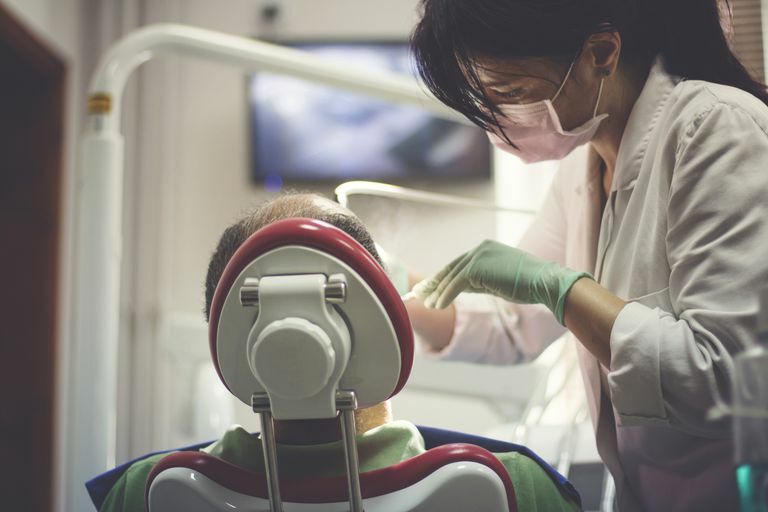 Dentistry was demonized early in the AIDS epidemic when it was suggested that the virus could be spread through contaminated dental equipment. Such claims were lodged in the public consciousness in January 1990 when a Pennsylvania woman named Kimberly Bergalis claimed to have been infected with HIV after having two molars removed by dentist Dr. David Acer in December 1987. The case remains controversial at best, with early investigations showing some genetic similarities in the viruses of five former Acer patients who also had HIV. However, doubts persist as the time between the alleged exposure and development of AIDS was incredibly short (less than one percent of people advanced to AIDS in this period of time). Additionally, Bergalis failed to report sexually transmitted diseases she had prior to the lodging of her claims. Similarly, in 2013, Tulsa-based dentist Scott Harrington was accused of non-sterile practices that some feared may have put as many as 7,000 of his patients at risk of HIV and hepatitis. The ensuing media firestorm reignited fears about the risk of HIV in dental practices, which were only inflamed when some reports suggest that 89 of Harrington's patients had contracted hepatitis C, five had contracted hepatitis B, and four tested positive for HIV. While this doesn't suggest there is no risk of HIV transmission, dental procedures are generally considered to be of low to negligible risk. In fact, there is greater likelihood of a dental surgeon being infected by an HIV-positive patient than the other way around. A person who believes themselves exposed to HIV as a result of blood exchange during an oral procedure can opt to take HIV pre-exposure prophylaxis (PEP), a 28-day course of antiretroviral drugs which can reduce the likelihood of infection. PEP procedures are also in place for health workers. HIV-positive people can reduce their infectivity by fully suppressing the virus with the use of combination antiretroviral therapy. Disposable dental fittings as well as strict adherence to sterilization practices can further reduce risk. Brush regularly and properly at least twice each day using a manual or electric toothbrush. Make sure the bristles of your toothbrush are soft to avoid trauma to the gum tissue. And remember to gently brush your tongue, as well. Flossing regularly and correctly removes plaque that builds up between teeth and prevents the development of inflamed gums, cavities, and sores..
Antimicrobial mouth rinses can provide additional protection from bacteria and bacterial infection. It's important, however, to note that mouth washes do not replace brushing and flossing but rather support overall good oral hygiene practices. Brown, D. "The 1990 Florida Dental Investigation: Theory and Fact". Annals of Internal Medicine: 124(2): 255-256. Moise, K. "Tulsa Dentist Spread Hepatitis C, Health Officials Say." ABC News; September 18, 2013. Oklahoma State Department of Health. "Health Officials Announce New Results of Harrington Investigation." Tulsa, Oklahoma; October 17, 2013.